Casablanca is great. It's the quintessential Hollywood film; a classic example of the studio machine: fantastic acting, an artful directorial style, a sentimental score, and a story that will warm the many frozen rivers of your cold, cold heart. It's filled with classic lines ("I stick my neck out for nobody!") and unparalleled drama…Of course, it's also a movie that's been released on Blu-ray before. The plot of Casablanca is simultaneously timeless and very period-specific. The story revolves around Rick's Cafe Americain, a local nightclub in Casablanca that is frequented by both fleeing European emigrants and oppressive Nazi soldiers. The joint's run by Rick Blaine (Humphrey Bogart), an American expatriate who claims to have been lured to Casablanca by the water (he was misinformed). One day, a love from his past, Ilsa Lund (Ingrid Bergman), arrives with her husband Victor Laszlo (Paul Henreid) in hopes of finding transit papers to America. Ilsa's return not only brings back a flood of painful memories for Rick, but puts him in the center of a tense stand-off between the local authorities and the French Resistance. The story is helped along by a wonderful supporting cast, including Peter Lorre, Claude Rains, and Dooley Wilson (who plays Sam, the piano player). Casablanca was first released as a fairly bare-bones single-disc edition back in 2000. Then Warner Bros. gave it the classic treatment and released the two-disc Special Edition in 2003. Now, in 2012 we have this "Ultimate Collector's Edition 70 Anniversary Blu-ray". The first two discs in this three-disc edition are identical to their Special Edition predecessor. This means that the video and audio are great and that there are some fantastic special features. The first disc has commentary tracks by critic Roger Ebert and historian Rudy Behlmer, an introduction by Lauren Bacall, and some trailers. Each commentary track provides detailed info on the making of the film as well as analysis on the film's look and style. They work well together, and are really the most valuable features in the set. The second disc contains a slew of documentaries and featurettes both about the film and the folks involved. First is the 90-minute documentary Bacall on Bogart, which features Lauren Bacall recapping Humphrey Bogart's entire career. There's also shorter videos like You Must Remember This: A Tribute to Casablanca, a behind the scenes featurette dating back to the film's first Warner Bros. DVD release, and As Time Goes By: The Children Remember, which is just the kids of the actors talking about their parents' legacies. There are also some deleted scenes, outtakes, adaptations, and parodies included on the disc. Again, this was all previously available on the two-disc Special Edition. The new material shows up in the release's third disc. Here is the lone new special feature: Jack L. Warner: The Last Mogul, a 60-minute documentary about the head of Warner Bros. back when Casablanca was made. The film chronicles the beginning of Warner Bros., when the brothers immigrated to America and started their first movie theater in the Ohio Valley before moving out West. There are plenty of interviews and archival photos to tell the tale, and it's all presented with the highest of production values. For as interesting as the whole rise-and-fall tale of Jack may be, it's hard to rationalize its inclusion in this "Ultimate Collector's Edition." There is just a passing reference to Casablanca at one point in the middle of the film…and that's it. And while it's true that Casablanca is one of the best examples of a studio-made film, this documentary never really makes the case for that. Even more unfortunate is the fact that there's plenty of room on this third disc for more extras, but all you'll find is this single video. If this set was just three little discs, you wouldn't have any need for this massive white box. To sweeten the deal, Warner Bros. has included a beautifully designed hard-bound picture book (similar to the book found in the Dirty Harry Ultimate Collector's Edition, also released by Warner Bros.), some postcards of various theater one-sheets, and some reproductions of studio memos. Finally, they threw in a Casablanca luggage tag and passport holder in an unnecessarily large, airy box within the box. While the book and the postcards are neat to look at once, it is unlikely anyone would see the luggage tag and passport holder as useful (unless you always want to be burdened with the thought of being trapped in a country while traveling). Casablanca: Ultimate Collector's Edition is a difficult item to judge, really. The film is just about perfect. Everyone should see it at least once, and chances are that after you see it once you'll want to see it again and again. But one can't but feel that unlike other big-box releases from Warner Bros., including Dirty Harry and How the West Was Won, this one is just a blatant and useless double-dip. With just one documentary and some trinkets being the only things new here, there is nothing else to say that it be worth picking up over the Special Edition, which costs less than half the price of this set. But, if you're a die-hard fan of the film, then this thing will definitely look good on your shelf…and that luggage tag will look great on your carry-on. 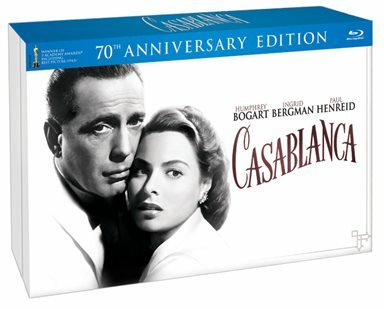 Download Casablanca (70th Anniversary Limited Collector's Edition) from the iTunes Store in Digial HD. For more information about Casablanca visit the FlickDirect Movie Database.